It’s time for a quick check in from Yellowknife where I am enjoying a fabulous time with talented and motivated fiber artists. After three intense days of exploring design we are nearing the end of three evenings of exploring Kantha quilting. Coming to Yellowknife has been one of the best experiences. I love to teach, and the wonderful benefit of flying from one place to another is that I meet great people and get to explore unknown surroundings. This time my adventure started with my magical flight to Yellowknife. About 15 minutes after take off from Edmonton International Airport I discovered outside my window that the plane was accompanied by Northern Lights. The Aurora Borealis show continued until the plane prepared for landing. I was getting increasingly excited and grew more confident by the minute that I would capture the dancing Northern Lights at least once during my stay in Yellowknife. 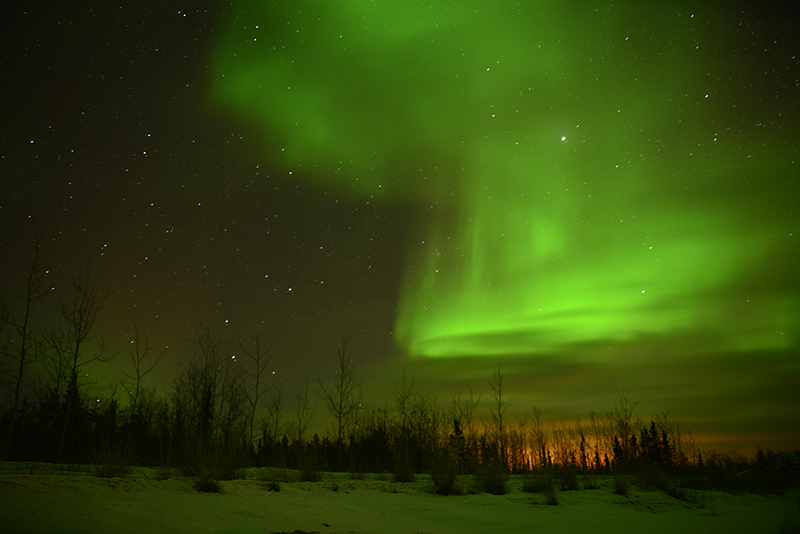 A late night tour on Saturday to the outskirts of Yellowknife in – 19 C (which turned out to be – 29 C with the wind chill) was all worth it. I captured some great images. The one I am sharing tonight is straight out of the camera without any enhancement or alteration. The lights were amazing, and based on these results I know in my heart that I have to return to this northern community in the future. The arts community here is vibrant and enthusiastic. Members of all ages gather to exchange ideas, learn and explore. Tomorrow will be my last day to explore the town and wrap up the Kantha class. Here are a just a few images of what happened in the classroom. I have many photos to sort before I can post more about the Aurora Borealis tour and excursions around the city. Thanks to Minnie and Marjory I have seen more than the usual tourist gets to explore – a tour of the Legislature and the Prince of Wales Museum are on the agenda for my last day… Can’t wait! 14 Nov	This entry was published on November 14, 2013 at 12:22 am. It’s filed under Art, Creativity Update, Design, Journaling, Travel and tagged Aurora, Aurora Borealis, Canada, Kantha, Northern Lights, Northwest Territories, teaching and traveling, Yellowknife. Bookmark the permalink. Follow any comments here with the RSS feed for this post. I also am anxious to see more photos of the Aurora borealis. I haven’t seen it since I moved from Sask and never such bright colors as your one photo here. I am intrigued by the Kantha stitching the ladies are doing and have two perfect pieces of imported cloth to do it on. Looks like the class was working on color wheels which be a very good exercise for me to undertake. You never cease to inspire Anna! Thank you for that. Linda, the color of the Aurora become visible only through the camera. The exposure for this image was about 15 seconds. I have never had such amazing results before. It was truly a magical night! Anna, the photo is awe inspiring. I am sure that the Northern LIghts have sparked your creativity and I expect to see at least one for your winter series and I can see in my mind’s eye a whole series. I love the ideas, tips and inspiration that spill out of your photographs, thank you so much for sharing. I look forward to your “Aurora Borealis Series”. Thanks, Kathy! A small group but full of ideas, energy and a zest to try something new. I feel energized and am grateful for such a wonderful time with everyone. I arrived a stranger and am leaving behind new friends. Can’t wait to return for a visit. Told you this was the best place ever. I always wanted to teach there but never did any kind of promotion of my work. How I envy you because I know that you have all ages and talented people to deal with there. Isolation makes for interesting people and good artists. This is my favourite place in Canada. Enjoy! And right you are, Leona! The best place ever despite the freezing cold and early snow. The Arts and Crafts Guild is the place you should have connected with while you were spending time in Yellowknife in the past – it is never too late to promote yourself! Wow! The colors in the Aurora Borealis are amazing & so vibrant. I look forward to seeing more of your photos. Thanks, Susan! Last night I had another opportunity to capture the Aurora from my balcony – it was less bright but mesmerizing all the same. Looking forward to finding time to sort the images and get them ready for posting.